Linnaeus’ bust in the garden of Hartecamp in Holland. In one of his autobiographies Linnaeus lists his own achievements. "No one has been a greater Botanicus or Zoologist. No one has written more books, more correctly, more methodically, from his own experience. No one has more completely changed a whole science and initiated a new epoch. No one has become more of a household name throughout the world...", plus another fourteen exploits. However Linnaeus was not the only one to speak well of Linnaeus. The philosopher Jean Jacques Rousseau, who seldom had anything good to say about anyone, sent a message to Linnaeus:" Tell him I know no greater man on earth. Goethe, the German author, wrote: "With the exception of Shakespeare and Spinoza, I know no one among the no longer living who has influenced me more strongly!" The queen of Sweden, Lovisa Ulrika is said to have remarked:" A very shrewd man, even if he doesn't look it." Jean Eric Rehn in particular has portrayed Linnaeus in everyday situations. 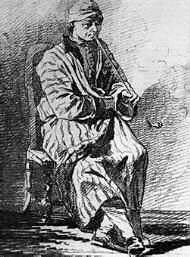 Here he is in his dressinggown and nightcap smoking his cherished pipe. However everyone did not admire Linnaeus. The flower painter Georg Dionys Ehret remarked:" When he was a beginner, Linnaeus laid his hands on everything he heard about, to make himself famous". Linnaeus’ Danish pupil, Johan Ch. Fabricius, wrote: "In the winter our rooms were just across the road from him and he came there almost everyday in his short red dressing gown, with a green furred cap and his pipe in his hand. He came for half an hour but often stayed for a full hour, or even two. His conversation was then very gay and pleasant. Sometimes he told anecdotes about learned men of his profession whom he had met at home or abroad and sometimes he illuminated our ignorant minds. He then laughed heartily and his face lit up with joy and gaiety demonstrating clearly how disposed his soul was for company and intimacy." "His heart was remarkably noble, though I am well aware that he was accused of many faults. His intellect was keen and penetrating: you could see it in his eyes. But his greatest characteristic was his ability to reason methodically: whatever he said or did was methodical and systematical. In his youth he had a wonderful memory, but all too soon it let him down... His passions were strong and violent...He could lose his temper abruptly or become very irritated; those feelings would disappear as quickly as they had appeared. You could rely on the constancy of his friendship; it was almost always founded on an interest in science, and all the world knows how much he did for his pupils and how devotedly, how ardently they returned his friendship and became his champions". Finally Fabricius has this to say about his time with Linnaeus. "I shall never forget those days, those hours and I feel happy whenever I think about them".